Imman’s uber cool album has spread its charm much wider since the film’s release. It continues to dominate the radio stations for another week. A surprise new music composer for Vikram’s 10 Endrathukulla? Vaalu or VSOP ? Which has the bigger share ? How lucky is No.25 for our current-gen heroes ! The common factor in 9 out of 16 Simbu films! 2 this week? and one more with a love specialist for Santhanam? Arya and Jayam Ravi might face a surprise 3rd contender! Vasuvum Saravananum Onna Padichavanga aka Vaasuvum Saravananum Onna Padichavanga is a Tamil movie with production by The Show People, direction by Rajesh, cinematography by Nirav Shah, editing by Vivek Harshan. 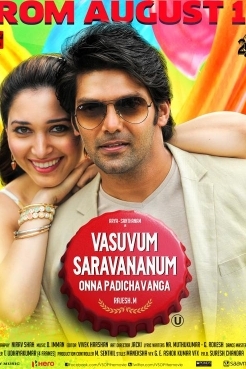 The cast of Vasuvum Saravananum Onna Padichavanga aka Vaasuvum Saravananum Onna Padichavanga includes Arya, Santhanam.